Writer's Block: Everyone has a story !! I believe in the title. Everyone has his own story. Maybe interesting or may be not. There are incidents or people which someone may overlook or ignore but they all have a value of their own. I met this man 7 years from now and used to see him almost twice a week. He used to sit along the roadside near a colony where my ex- girlfriend lived. So on the way to meet my gf I used to cross that part of the road and my eyes would fall on him. I have watched this man in almost every season and I would wander how he survived in the extreme conditions of weather. But this is life. What surprised me more was that I could make out that he was not a beggar. He did not beg but I wandered how he survived then. I did not discuss my views with anyone. Only my silent gaze every single day used to update my thoughts and I kept them to myself. I was somewhere getting it interesting to learn the situation by myself on every new day. Once I saw that few people were talking to him and few kids were sitting beside him on the old dusty carpet under the tent he had made for him. The tent had a small space inside for just one person to sleep or at the max sit. It was shaded by a blue plastic. On normal weather conditions he did not use the tent ( I closely watched him in every season on every day I went by the street for 6 years , so I have analyzed a lot by myself). The clothes of the people and the kids implied that they were not beggars either. Maybe they are not financially good but still they might have a home and don’t live in streets. This was not the only time I saw them. I had seen these people coming and talking to him. This old man talked rudely to them and abused the kids even as they were doing naughty stuff or irritated the old man in many ways. However it was clear that he had some connections with these people in some way or the other. 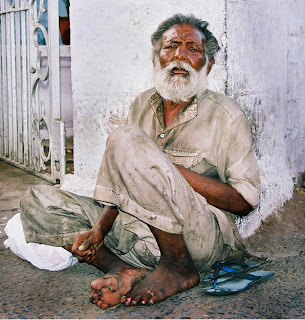 I was also amazed that why this man on the street was not a beggar and he never begged from the passer bys. Then how did he survive and what was his source of food? But when years of my travel did not gave me this answer, out of curiosity I asked my girl friend once. She told me the story. He was a Muslim guy. Once he had some heart troubles and his family members thought he was dead. They took his body to bury. But he woke up somehow and his family members realised that he was alive. In Muslim relegion I think (according to my ex- gf) there is a belief that they don’t take a person back once they take him for funeral. So these people could not take him back to home. He lived the life of a beggar. They used to come and meet him even gave him food. Till the last day I have visited those streets I got a glimpse of that man and used to think how weird is the country and how weird are the rules. This is not for a particular religion but every caste creed religion has a specific set of weird rules which causes so much of trouble and I don’t find any reasons for them. P.S : All of this is just what I have heard and I have no intention to strike any religious issues. Its about this unique world and their beliefs.